This is little Debbie. At the tender age of 46 she has had to take responsibility for seeing that other people send in their money so that she will have an extensive staff. Yet every day over 22,000 DNC staffers die… most from preventable causes such as hunger. Many are forced to live on salaries that are barely twice the median income for US residents. They are forced to eat cheap caviar, and most will never know the taste of a really good bottle of champagne. Amazingly, this problem exists in the capital of our country. People forced to try and live on salaries that scarcely reach 6 figures. They don’t know that they could have a better life. They don’t know about YOU. Yes, you. You could make the difference, by simply skipping a few meals a week to provide for contributions to SAVE THE STAFFERS. You could be the one that turns their life around. Sure, you could switch channels when this comes on. You could say you’ll do something, then forget tomorrow. BUT… you could pick up the phone and call now, and make the difference in one of these young lives. Don’t wait. Even as you listen to this message they may be missing a party for lack of a meal. Your contribution could make the difference. Won’t you help? Little Debbie needs to learn to eat Peanut Butter and Jelly like the rest of America. Bet she is upset because she and her staffers haven’t had a million dollar government paid vacation this year as well. 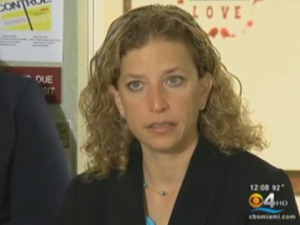 Well Debbie go knock on the White House door and share your grievance. You voted for him I am sure and he said he would take care of your entire needs and all your wants.